When should I place my wedding order? Most couples would love to get everything off the “to do” list ASAP. Ordering your wedding cake is NOT one of them. However, we can get the process started as early as 6 months prior to the wedding date. We can finish the whole process usually 3-4 weeks before the wedding date. The reason for this is that we need to have the final RSVP count to adjust the size of the cake. Typically, we like to start the process 3 months before the wedding date so the information we talk about is still fresh in our memory. Please keep in mind that during the holidays of Easter, St. Patricks day, Halloween, Thanksgiving, and Christmas, we are extremely busy, so consultations are limited during these times. The only staff members that are qualified to take a wedding order is someone from the Deising family, a manager, or one of our decorators. Most times, the Deisings work from 4 am until 2pm. One of the Deisings are in the building during those hours. Our decorators are here between 5am and 1pm. A manager is here until 4-5pm. It’s best to plan a morning appointment between 8am and 12pm. On Saturdays and Sundays, we are extremely busy making wedding cakes and celebration cakes, so typically we try to avoid doing consultations on those days. Exceptions can be made if we know we do not have too many wedding cakes for a particular weekend. Please do not be upset if we cay we cannot do a tasting on a certain day. We just want to be able to fulfill our promises to wedding couples who have entrusted us to make their wedding cake perfect. Bring any pictures that you want, whether it be on your phone, tablet, or from a magazine. We have free wifi here at the bakery so we can look up anything. Also, if you have specific colors to apply to your cake design, then please bring a color sample/swatch for us to keep. Does the wedding appointment cost anything? No, it does not cost anything. We offer you a free tasting for up to 3 people. Additional guests are 4$ per person. Samples of our cakes, icings, and fillings will be presented to you. We will review pictures and options at this time. We are a full service bakery, so feel free to pop in anytime and purchase any of our delicious cake slices. How long is a cake consultation? To get answers to simple questions such as price, servings, and ideas, you can just call the store at (845) 338-7505. For a sit down tasting, we usually take about 20-30 minutes, sometimes longer. 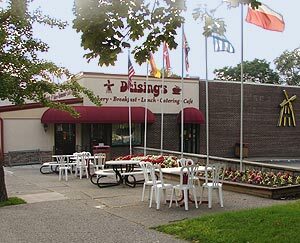 How big is a Deising's cake serving? We offer a typical size serving that you would serve at your birthday party. (about 1.5 inch by 3-4 inches). Many other venues cut them much smaller. You won’t run out of cake with Deising’s! How much does a tiered cake cost? There are many factors that can change the price of your cake. A good average to estimate is $3.25 per guest. This includes the filling, cake, icing and most designs. You can get a beautiful wedding cake for that price. We will work with you to stay within your budget. Other additional cost may include delivery, equipment rental, and set up charges. Why do tiered cakes cost so much more than single tiered cakes? Tiered cakes require additional time and materials to construct so that the cake doesn’t topple down. Each tier has to be completely level and have an internal structure to secure it. It takes at least 4 to 5 times longer to build, frost and stack a tiered cake than to build a sheet or a round layer cake. Additional time is also needed for the consultation and for artwork. The more detail, colors, materials and hand work required to decorate the cake, the more time it will take; consequently, the more the cake will cost. No. Making a fake cake takes just as long as a real cake so what’s the point if it does not save you money? What flavors of cake batter can I choose from? Our classic cake batters include vanilla, chocolate, marble, or a combination of any of the above. Our specialty flavors include carrot cake, black forest, *strawberry, *almond, and *lemon. Specialty batters have a small up charge from the classic batters. *means these may not be available at your tasting. Please request these before a tasting. Even then, we may not be able to offer them at your tasting because we cannot make such a small amount. What fillings can I choose from? Included in your basic cake price are – vanilla custard, chocolate custard, mocha custard, lemon custard, buttercream, chocolate buttercream, mocha buttercream, maple buttercream, whipped cream. Fruit filling choices are strawberry, cherry, raspberry, apricot, apple, peach, pineapple. Many customers enjoy combining the vanilla custard with a fruit filling. Our most popular filling seems to be the strawberry with vanilla custard. At a small additional charge, we also offer canoli, fudge, rum custard, amaretto mousse, chocolate mousse, apricot mousse, cappacino mousse, banana custard (made with fresh bananas), strawberry mousse (made with fresh strawberries), fresh strawberry with either whipped cream or vanilla custard, blueberry mousse, raspberry mousse, hazelnut mousse, hazelnut butter cream, peanut butter filling, peanut butter mousse, pina colada (rum, pineapple, coconut), coconut cream, chocolate mousse with chocolate chips. Can I have silk or fresh flowers on my cake? Yes. If you are using silk or fresh flowers, just drop them off the day before your wedding date. Include your name, reception hall, date so we do not mix them up with other wedding orders. The cost for these flowers are additional to you and are not included in the price. We will however put them on at not charge. What are grooms cakes and do you make them? Yes, we absolutely prepare groom's cakes! The groom's cake is an old English tradition where small pieces of cake, generally dark, rich, liquor-saturated fruitcake, were boxed and given to the unmarried female guests to take home and place under their pillow. The myth promised that while sleeping with the cake under her pillow, she would dream of the man she would marry. This tradition took hold in the southern United States and has slowly migrated to the rest of the country. In the U.S., the groom's cake is usually a chocolate cake decorated to represent the groom's hobbies, career, or with a fun, contemporary design and is often the dessert served after the rehearsal dinner or displayed with the wedding cake. Check out our Groom's Cakes Gallery for some samples of Groom's Cakes that we have created. Absolutely! You can get the process started by emailing to deisingspics@gmail.com. Attach the photo of your cake you are interested in, the date of the reception, and the wedding hall. Do you offer dessert tables and center piece cakes? Yes. These are called Viennese tables or European desserts. We have the largest varity of these pastries than anyone else in the Hudson Valley. Choose from a variety of cake combinations in individual sizes, plus min eclairs, mini cream puffs, mini tiramisu, mini carrot cake, mini brownies, mini cheesecakes, mini Napoleans, mini canoli, baklava, any others. We also offer our famous butter cookies (voted best in the Hudson Valley). These can be done in a variety of different size platters to be displayed as a center piece on each table. Yes. We offer deliveries roughly within a 40 mile radius of Kingston NY. Delivery costs vary and are based on time and mileage from mapquest. Roughly, you can estimate about 1$ per mile ROUNDTRIP. A 40 mile trip would cost 80$ plus a 25$ set up fee equaling 105$. This price can change if the roads are not highway miles. Back roads and country roads take longer to navigate, especially when driving with a wedding cake, so additional charges may apply. Do you ship wedding cakes and birthday cakes? No. Due to the fragile nature of cakes, we can not ship cakes. Call the bakery during business hours. (See details at the top) . A supervisor or manager can answer many of your questions if you can not find them on this website. To speak with one of our decorators, please call between 6am and 1 pm. Can I return a cake if I do not approve of it? With any cake other than a wedding cake, approval of the product is requested at the time of pick up. Any corrections can be made at this time. Please inspect your cake for color, design, and spelling. Of course we want our customers to be completely satisfied with their purchase, so we do everything we can to ensure you are satisfied when leaving our store. We ask that you call the store (845-338-7505)to place an order so we can clarify the information and ensure accuracy. If you send us an email deisingspics@gmail.com, we will follow up with an email or phone call. Do you require a payment or deposit at the time of the order? Yes, we do ask for full payment or at least ½ deposit at the time of the order. This is now necessary because in the past few years, some customers never picked up their orders, some of which were very customized and costly to make. For wedding cakes, final payment is due 2 weeks prior to the event. For wedding cakes, please refer to the information above (1st question). For specialty shaped cakes, we would love to have 2 weeks notice, but feel free to call us and we’ll see how we can accommodate you if you need something sooner. What if I need to change my order or cancel it? For specialty and sculpted cakes, we need 3 days notice in order to get a full refund. If less than that, depending on the design, there may be a 50% no refund policy. If it is a cake that is small enough to sell in our store, we will refund you if it sells. Can I change or cancel my wedding cake? You can change your order up to 3 days prior to you event. If you need to cancel your cake, you have 1 week prior to do so. There will be a 25$ charge for the consultation, tasting, and time that was needed to take and handle your order. It depends on what you are ordering? If it is something we carry in our store on a regular basis, there is no minimum. If it is a specialty item, cupcake, or roll or some other product that are made to order or only carried during the holidays, minimum orders do apply as we sell by the batch to minimize waste. Do you offer quantify discounts? Yes, everyday we offer “Deisings Dozens”. When you purchase or order the following by the dozens, you automatically receive a discount- European pastries, rolls, doughnuts. Other situations can be applied to discounting. Only a manager can approve of discounting. Also, with proof of ID, for school, churches, or veterens, we offer a 10% discount on PRE-ORDERED items. Events must be for school or church functions in order to be applied. Yes, but not all of our products can be shipped due to the fragile nature of some of these items. Check out our on-line store on this site for a product menu. My grandmother had a recipe, can you make that? As much as we’d love to be able to accommodate every request that we get, our equipment is very large so when we bake anything, we are making 50 gallon batches, which is a very large amount. We do not have bakery equipment small enough to bake a single or double cake. Yes we can. 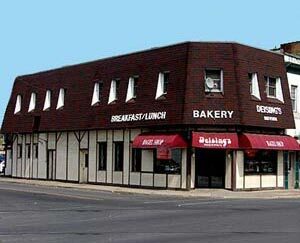 You are welcome to bring in your image into the bakery or email us at deisingspics@gmail.com . If pulling images of the web, please keep in mind that we are subject to copyright laws, so we’ll need written permission from the owner of that image to be able to reproduce that image. We prefer your image to be in jpeg format. The more pixels your image has, the clearer we can reproduce it. The smallest image we can reproduce from the web is a 700x700. (some exceptions can work). For copyright issues, we offer a very large selection of Disney, and other TV network shows that can be applied to a cake. Some in picture form, others in “kit” form, meaning toys that are placed on the cake and decorated accordingly. I saw a cute Minnie Mousse cake on-line. Can you match that for me? Yes and possibly, no. Because we are selling our cakes to you, we are bound by Copyright and Trademark Law. This means that any character that is trademarked, like Mickey Mouse and Minnie Mouse, college or company logos and most other characters from popular TV shows and movies are off limits for our bakery to reproduce unless we have written permission from the owner of the copyright or trademark. The reason you see them online is because many of these cakes are being produced by hobby bakers for their families and friends and are not being resold to the public. We are not allowed to make money from someone else’s intellectual property. We do, however, have a wide variety of “licensed” toys that we can put on your cake. Do you make sugar free baked goods? Do you make gluten free baked goods? By the restricted guidelines set by the government, we cannot produce any gluten free items in our facility. You need to have equipment and a separate room in order to produce them, which we do not have the room for. We have teamed up with Bearsville Bakers who now sell their Gluten free products in our store. Choose from brownies, pound cakes, and cookies. They taste quite delicious! Some of our products do contain nuts. All of our products are made in the same machines used for these products, therefore may not be suitable for individuals with nut allergies. We ask that all products are approved at pick up and due to the nature of our products, we cannot accept returns or issue refunds. However, we want all customers to be 100% satisfied with their Deising’s Bakery experience. If for some reason you are dissatisfied, please contact the bakery within 24 hours of your purchase and we will do our best to address your concern. Depending on the circumstance, a store credit may be issued in the agreed amount. We do. To sign up, click here. You will receive monthly e-newsletters and promotions. Can I order from my Smart Phone? Yes. Deisings has our very own app for android and iphones. This amazing ap allows you order from our to-go menu, get discounts, prizes, games, and so much more. Can you make adult themed cakes for my bachelor/bachelorette party? Yes, we can. Please call the store and speak with a decorator between 6 am and 1 pm.